Amit Singh thought something was missing from OS X. The Google engineer—and author of Mac OS X Internals—took a look at what the Mac operating system didn’t have that Linux and Solaris did. “One thing stood out,” Singh said. “There was no easy way to do file systems.” So Singh decided to create one, even though he worked for Google’s search team at the time and wasn’t part of the company’s Mac development efforts. The reaction of his bosses to this use of company time? Go for it. Singh’s project, which became the open-source file-system utility MacFUSE, is just one of the many employee-driven efforts that go on within the walls of the search-engine and text-advertising giant all the time. Google calls it “20-percent time,” encouraging its engineers to pursue other Google-related interests for up to 20 percent of their work hours—even if that interest has little to do with their regular duties at the search and software company. Efforts such as 20-percent projects by engineers like Singh are par for the course at Google, a company that sees encouraging employees to pursue subjects they find interesting as a critical part of its own development goals. “A lot of things that happen at Google are based on empowering people to come up with ideas and pursue them if [those ideas are] good,” said Sundar Pichai, Google’s director of product management. Many 20-percent projects have wound up becoming major Google products: both Google News and Gmail, for instance, started that way. 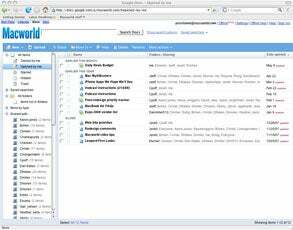 Among the Mac-specific efforts that began as 20-percent projects are Notifier, which offers Gmail and Google Calendar notifications, and the Google Mac Developer Playground, an online collection of open-source Mac projects created at Google. These days Google’s offerings for Mac users include everything from a desktop search tool to a 3-D mapping tool to a suite of Web-based office productivity apps. In between, you’ll also find a 3-D modeling program and add-ons for the Firefox Web browser. But Google’s Mac offerings weren’t always so vast. The company has stepped up its Mac efforts in the past couple of years, as a result of a strategic push from executives as well as prodding from Mac-using Google employees. Google Docs gives users access to online tools such as a word processor and spreadsheet app, though support for the Safari browser has been spotty. Google’s corporate philosophy is to make information as accessible and useful as possible. Still, “as a company, when you’re starting out, you have to make hard tradeoffs,” Pichai explains, and for Google, that meant initially building desktop products that worked on Microsoft Windows. But Mac-using Google employees were working hard in the background to expand the company’s products onto the platform they loved. When Karen Grunberg, now a product manager for Google’s client software on the Mac, first joined Google, she found the limited portfolio of Mac products to be “very ungoogley”—a term you’ll hear around the Google campus in Mountain View, Calif., to describe something that doesn’t measure up to the company’s way of doing things. That attitude has made it “easy to recruit” a Mac team for Google, Pichai said, since the company can draw on the talents of employees already working on Mac projects as part of their 20-percent time. However, Google keeps the exact size of its Mac development team under wraps. Company executives declined to say just how many employees make up its Mac efforts, instead pointing to the frequency of Mac product launches—from zero to six in the past few years—as a sign of its commitment to the platform. One of the recruits to the Mac team was Singh, the engineer who developed MacFUSE as an open-source project and now works as an engineering manager on the Mac team. His experiences on that project—”the easiest open-source release ever,” he says—have been mirrored on the Mac team, largely because of the atmosphere created at Google. Engineers are not only given the time and freedom to pursue projects, they also have the assurance that good ideas will be embraced by the company’s higher-ups. And that may be the one of the biggest benefits Google offers, on a campus full of Silicon Valley-style perks. Amenities include an on-site doctor’s office and gym, a place where employees can drop their cars off for an oil change, and wireless-Internet-equipped commute shuttles. The Mountain View campus boasts 18 cafés, each with their own culinary focus, and all free to Google employees. But talking to employees, you get the impression that the real perk is the massive talent pool that Google has assembled. The inventor of Python works at Google, Singh notes, as do prime movers behind the creation of both UTF-8 and Unix. And at a company that stresses collaboration and accessibility, it’s easy enough to schedule time on someone’s calendar—using Google Calendar, of course—to drop in and chat, Grunberg said. That spirit of collaboration has been key to helping the Mac team establish itself at Google. Besides the challenge of bringing the Mac versions of applications in line with their Windows counterparts, the Mac team also had to consider issues that are particular to the Mac OS—or, taking “existing products and getting the same experience while maintaining the standard Mac users expect,” as engineering director Marc Pawliger puts it. Take Google Desktop, the company’s desktop search application. Google programmers had to consider OS X’s own built-in search technology, Spotlight, and how Google Desktop would work with it. In the end, Google positioned its desktop search utility as a companion to Spotlight, giving Mac users the ability to search content from Web pages they’ve visited and Gmail accounts in addition to desktop files. Google programmers also worked on ways to preserve common actions for users on different platforms. On the Windows version of Google Desktop, users summon the Quick Search Box feature by press the Control button twice; for the Mac version, pressing the Command key twice does the trick. 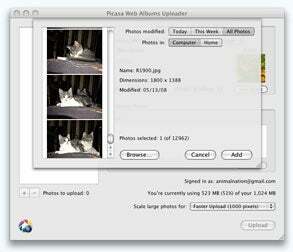 Google built an uploader that allows Mac users to share photos online via its Picasa Web Album offering—an example of how the company tailored one of its products for the Mac platform. “There really is a push here to say how do we balance the parity of experience across platforms with the need for users to get their work done,” Pawliger said. Or take the case of Google’s Picasa, a Windows program that finds, organizes, and shares photos. Since that product mirrors much of the functionality of Apple’s iPhoto, there would seem to be little incentive for Google to create a Mac version. Yet, rather than ignore the platform, Google built a photo uploader that works with iPhoto—another 20-percent project—to allow Mac users to connect iPhoto to the Picasa Web Album feature for sharing photos online. Not that there isn’t work to be done on the Mac platform. The online Google Docs productivity apps offer only spotty support for Safari, OS X’s built-in Web browser. And Google Gears, an open-source effort to let Web apps work on the desktop isn’t compatible with Safari at all. As Google’s Mac offerings become broader, its Mac development team can put more emphasis on cross-platform collaboration. In many ways, Pichai says, the Mac team is “helping lead development” with the contributions it’s making to Google products. “There’s been huge progress since I’ve been at the company,” Grunberg agreed. “We’ve been working a lot harder at making sure products are developed in tandem” for both platforms. As work continues on its Web-based apps, Google is turning an eye toward other areas where it can apply its information-management focus. Mobile platforms will certainly be a key part of Google’s future, with the iPhone taking center stage. The company is also looking at ways to bridge the gap between Web-based applications and the desktop, largely through Google Gears. Google has announced plans to let users of its online word processor view and edit documents offline.